When teachers ask students to write a critical essay, it means that there is a need not only to find some materials on the given topic, but also analyze it from a critical perspective. In critical writing, one can either accept writer’s point of view or disagree with it. Therefore, it is very important to develop a sense of persuasion if you want to effectively prove your standpoint. Any logical gaps or inconsistencies will disprove your competence in critical writing, so be sure you read the article till the end to see how to work on critical essay writing. If you do not know how to write a critical essay, you probably find it difficult to get started. You take a piece of paper and do not know what will be your first sentences. Remember that you must investigate the topic from all possible sides and evaluate research arguments. Therefore, your first step will be reading mostly. Find some relevant books and articles on the topic and make some notes. Did you notice some contradictory ideas? If yes, then you are on the right track and are able to find similarities and differences in ideas of researchers. Evaluation (summary) of the author’s standpoint. Author’s key ideas and themes. Evaluate validity and relevance of key author’s arguments. Discuss if there are any mismatches in presenting argumentation. Present your own opinion about the text (if writer managed to cover the topic or not). Before working on critical essays, it is essential to create a plan that will guide you in the right direction while writing. Composing an outline will give you a chance not to waste time on breaking your mind by thinking what to write further. Outline writing is sometimes compared with creating a roadmap, which clearly shows what your possible arguments can be. Create as detailed outline as possible and do not forget to refer to the basis of your work – the required reading. Then your outline should be extended into the first draft. Your critical essay should be revised a couple of times, until you are 100% positive that you covered professor’s instructions. Follow common writing standards and ensure that there is an introduction, main body, and conclusion in your paper. Pay attention to the choice of vocabulary and grammar rules. Many students fail to understand peculiarities of critical writing. 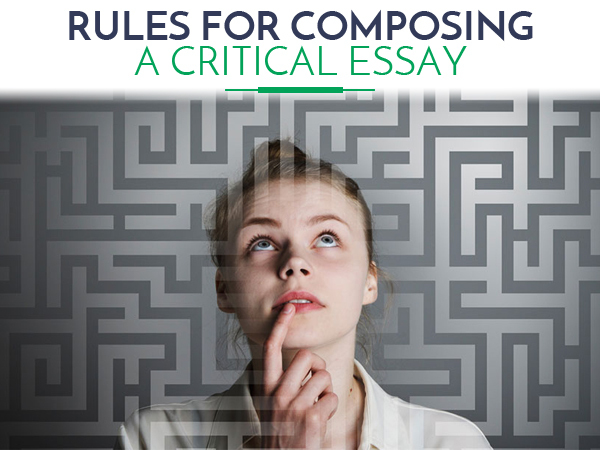 Composing critical essays is based on a deep research of the problem and analysis of the given text. The paper should not be informative in its nature because your primary focus is criticism, not simply informing the reader about an issue. All your claims should be supported with relevant research ideas. Critical writing should clearly reflect your objective tone, even if you have to choose one side or another. Maintain unbiased tone in writing and refer to evidential support rather than your emotions while working on a critical essay. Do not forget to format your paper according to a citation style your professor asked (MLA, APA, Harvard, Turabian, Chicago, etc). Did you use only newly published and relevant materials? Did you cite all borrowed information? Did you summarize the required reading or properly analyzed it?